The Visidec VF-AT-NBC Laptop and Monitor Arm Combo, provides a mounting solution for notebook users who work with additional monitors. The system ships with two arms that can be independantly adjusted for height, position and orientation. It allows a high degree of operational flexability with configuration that can be adapted to the work environment, user situation, and task at hand. 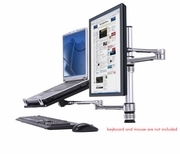 The monitor and laptop display can be positioned side by side for a dual screen configuration or separated for detail examination and group work. While improving productivity, the VF-AT-NBC can help reduce eye strain and encourage a healthier posture. Maximum reach, monitor arm: 16.25"